Republican candidates show little foreign policy knowledge in GOP debates: The party’s candidates appear shockingly ill informed about international affairs. Republican presidential candidates Wisconsin Gov. 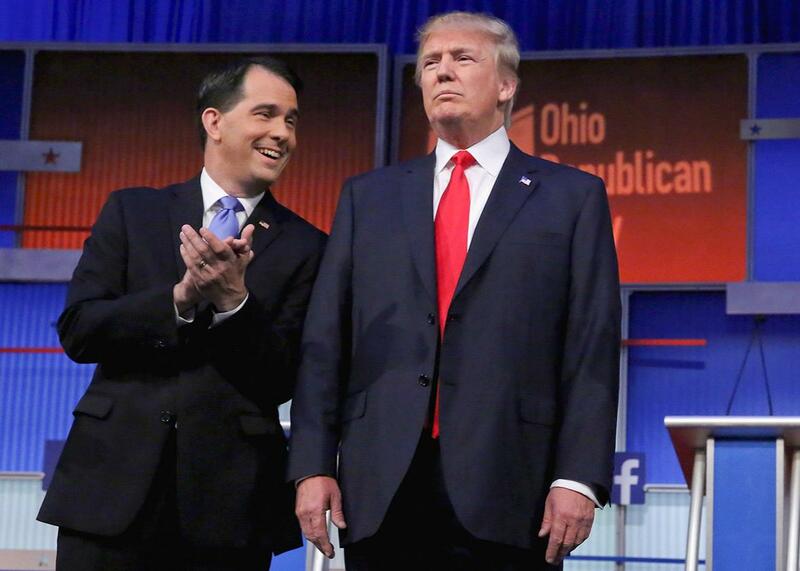 Scott Walker and Donald Trump take the stage for the first prime-time presidential debate hosted by Fox News and Facebook at the Quicken Loans Arena on Aug. 6, 2015 in Cleveland, Ohio. Foreign policy was hardly the centerpiece of the Republican candidates’ first debate, but when the topic came up, their answers revealed that none of these White House hopefuls have given the world and its problems an hour of serious thought. The 5 o’clock B-team debate—among the seven contenders whose poll rankings disqualified them from Fox News’ prime-time slot—spent more time on foreign policy, but the picture wasn’t pretty. Fiorina also said that, on her first day in office, she would tear up the Iran nuclear deal, after calling her “good friend Bibi Netanyahu,” and then, on the second day, hold a summit with our Arab allies, including her “friend King Abdullah of Jordan.” These acts and conversations would send a signal that “America is back in the leadership business.” At the moment that she said this, the ambassadors from Britain, France, and Germany were urging 30 members of Congress to support the Iran deal, saying that rejection would trigger a “nightmare” and a “catastrophe”—thus sending a signal that they were fine with American leadership as is. Rick Perry, who probably came to the debate fully prepped to recite the three cabinet departments he’d abolish, said that thousands of Americans have died in Lebanon and Iran—among several other incoherent statements. He also said that he’d send Fiorina to renegotiate an Iran deal—thus sending a signal that she would probably make a better president than he would. On to the prime-time debate. Sen. Rand Paul and Gov. Chris Christie clashed over the National Security Agency, Christie wanting to expand its surveillance tools, Paul to curtail them. Paul also called for slashing foreign aid, including to Israel. And while he criticized the Iran deal, like the other Republican candidates, he also said, “I don’t immediately discount negotiations,” noting that Ronald Reagan negotiated with the Russians. None of these comments drew much applause. Gov. Jeb Bush acknowledged that invading Iraq was a bad idea, in retrospect, but then turned the table, saying, “Here’s the lesson we should take from this: Barack Obama became president, and he abandoned Iraq.” Bush ignored the fact that his brother’s administration signed the Status of Forces Agreement of 2008, requiring all U.S. forces to withdraw from Iraq by the end of 2011. Carson also recited some numbers he’d learned—that our Navy is the smallest since 1917 and our Air Force the smallest since 1940—ignoring that one Navy ship today has far more firepower and maneuverability than the entire fleet of an earlier era. Mike Huckabee went the same route, noting that the Air Force is flying some B-52s that are older than he is. This ignores a few things: B-52s are hardly the newest planes in the fleet; they’ve been upgraded, to the point of being rebuilt, many times; and, given their current mission—dropping conventional smart bombs from very high altitudes—they’re performing just fine. Huckabee also fanned the flames on the Iran deal. “We got nothing,” he said, while “Iran gets everything they want”—ignoring that the deal requires Iran to slash its enriched uranium by 98 percent, its stock of centrifuges by two-thirds, and much, much more. There are legitimate criticisms to file against the deal; this isn’t one of them. Gov. Scott Walker piled more wood on the fire of the Iran nuclear deal, saying we should add more crippling sanctions “and convince our allies to do the same”—this, in a tone that made his proposal seem the easiest and most obvious solution in the world. All the candidates seem to think it’s all so easy. Donald Trump was the exemplar of this attitude, slapping Obama as “a president who doesn’t have a clue,” while evincing not the slightest signs that he himself does. Christie wrapped up the foreign policy portion of the evening by disagreeing with Paul once again, this time over foreign aid to Israel. “I absolutely believe Israel is a priority after eight years of this administration”—ignoring the many Israeli officers who have said that President Obama has given more security assistance to their country than any president in recent memory. This is going to be a long, tiring election season.